Having been in the sweets business for about a decade, bulk retailer CandyStore.com crunched private sales data to compile a timely “Top Valentine’s Candy by State and Nationwide” survey. This is important because in four short weeks people in love will celebrate the “holiday” by exchanging gifts, including about $1.7 billion of candy. Last year, they added, “conversation heart candy vodka infusions” became trendy, because of course they did. In a big-picture sense, heart-shaped boxes of chocolates no longer reign supreme. Those aforementioned conversation hearts (with or without booze) actually rule, with 10.2 percent of all candy sales to 9.6 percent for boxed chocolates. The top Valentine's Day candy, broken down by sales data from each state. Pennsylvania: This may come as a surprise in the land of Hershey, but M&Ms were No. 1 with heart-shaped boxes and conversation hearts filling out the medal stand. 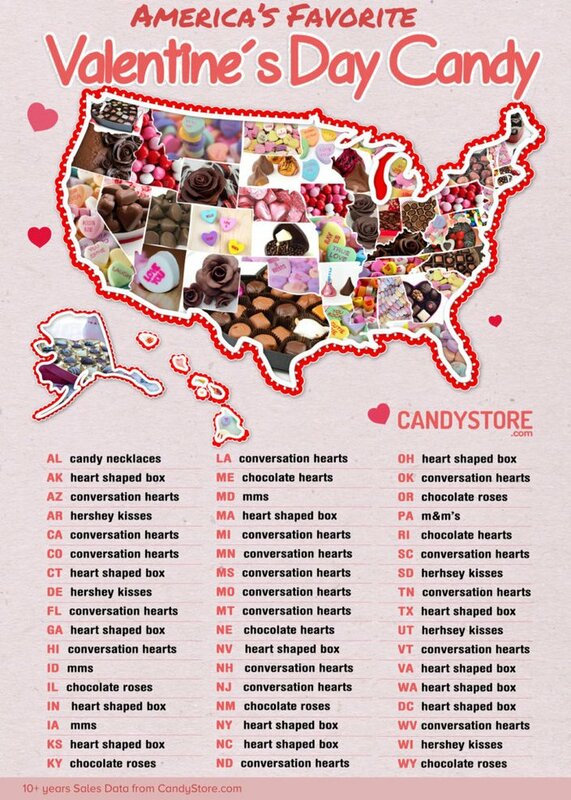 New Jersey: Conversation hearts topped the list with chocolate boxes and “Cupid Corn” coming in second and third. Delaware: Hershey Kisses are the most-purchased candy in the First State, with conversation hearts and chocolate hearts rounding out the list.